Is it just me or is the American system of state primaries really bizarre? And I don’t just mean the Iowan ‘we don’t believe in the secret ballot’ thing. The very fact that the results in Iowa and New Hampshire take on great significance is a clear sign that something isn’t working properly. I mean, no disrespect to those two states, but they account for less than 2% of the country’s population between them. And yet if Clinton does badly in New Hampshire, her two losses will be seen as seriously damaging her chances. And indeed they probably will affect her chances, because there will be a storm of media coverage which will have a psychological impact on voters elsewhere in the country. I know it would be too much to expect that the pundits might treat these early results with the lack of interest they deserve, since it’s their job to express opinions and they’ve been dying to actually have some scores to report on from months now, but it just seems like madness. I don’t know. I’m only seeing it from outside. Perhaps I just don’t get it. Perhaps there’s some reason why it’s actually a brilliant idea. 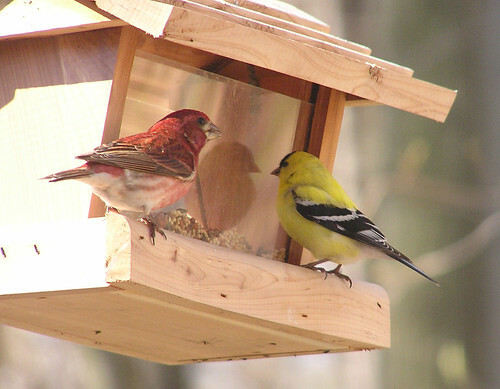 » The Purple Finch and American Goldfinch are the state birds of New Hampshire and Iowa respectively. The photo was posted to Flickr by Grant Leavitt. The defenses of Iowa and NH coming first are twofold. 1. Both states are very small, so the candidates can (and do!) reach the entire population with their message. Those who favor this claim that if your message can’t be sold with this near one-on-one opportunity, it can’t be sold to the country at large. 2. Both states are swing. They aren’t hardline red or blue so they act as a better barometer than big states like California or Texas. But why not have all the primaries on the same day? All electoral systems have their quirks, of course, and most of the time they probably don’t make much difference to the final outcome. But still, I see something like that and it just annoys me that it’s not right. Like those people who can’t stand to be in a room where the paintings aren’t hanging straight. I’m with you on this one, Harry. As an American voter from a state whose primary is still in the traditional month of May, I resent having no voice in the decision. Not, mind you, that I’d want Kentucky to move it’s primary to February like everybody else. That’s all just ridiculous. I am very, very weary of the perpetual race for President. I don’t mind Iowa and N.H. being first but I do mind the media hype that makes their choices THE choices. It hasn’t always been that way. And as tonight shows, it may not always be that way. I think we should rejoice in the race we have, on the left anyway, amongst such a strong field. No need to rush to a decision. Mind you, I’m a great believer in a free press but lately what we’ve developed is more like a pack of high school kids. It’s all about who’s cool. And what we’ve been calling debates — omigawd, we should hang our heads in shame. Oh — and yes, I’d be in favor on one national primary day. In some reasonable month. Like, say, May. The American system does at least make for great political theatre, of a sprawling kind. You can see why it creates such a culture of political junkies, among journalists and bloggers as well as politicians and activists. The idea behind not having all of the primaries on the same day is that it allows candidates without as much money to compete and get airtime and funding. And, frankly, if it were all on one day, only those of us in the biggest states would have any voice at all. I get tired of living in a swing state already! Well, it is in the nature of a democracy that if there are more of you, you get more of a say. But the source of the problems is really that the election is done on a state-by-state basis at all. The fairest system would be to have the presidential candidates and then the the actual general election decided by a direct national vote. One person one vote, with all votes equally important. I know there are historical reasons why it’s not done like that, but it’s hard to argue that they still make much sense—if they ever did. There was actually a widespread–and disorganized–attempt at changing the primary order this year, because neither of the first two states are at all representative of the country as a whole (Democrats actually thought it might be nice if some non-white folks got to register their preference when it was early enough to still matter). Turns out that in NH, it’s in their state constitution that they must be the first primary in the country (no explanation of how that ever happened)–and for whatever complicated don’t-sue-us reasons, the two national party organizations caved to that. A couple of other states–Wyoming and Michigan–bumped up their dates regardless of what the parties said; as a result, Wyoming lost half their Republican delegates and Michigan Democrats only have Clinton on their ballot. It’s not your outsider perspective: It really is that messed up.